In addition to pre-orders and limited in-store availability for walk-in customers starting Friday, Apple will also begin accepting reservations for the iPhone X starting this weekend in several countries outside the United States. Reserve and Pickup will reopen Saturday, November 4 at 6:00 a.m. local time in Belgium, Canada, Mexico, Switzerland, the United Arab Emirates, and the United Kingdom. We want to stress that reservations no longer begin at 8:00 a.m. in these countries, as Apple changed the time to 6:00 a.m. after this article was published. After this article was published, Apple updated the page in Australia and Hong Kong with a notice to check back on October 27. Since that date has already passed, Apple may not be accepting reservations in those countries, but we encourage customers to check the pages periodically in case things change. In those countries, customers should be able to select the iPhone X color and storage capacity they want and reserve that model for pickup at the Apple retail store they specify. The models available, if any, will vary by location. Other countries where Apple retail stores operate may be included, but we couldn't find other region-specific links yet. Unlike the standard in-store pickup option offered during the checkout process on Apple's website, which requires paying upfront for the device, the Reserve and Pickup system lets customers pay for the device in store upon pickup. Reserve and Pickup also lets customers bypass the current 5-6 weeks shipping estimate of pre-ordering with in-store pickup. The pickup generally must be completed within a 30-minute window selected, or else the reservation may be canceled. A valid government-issued photo ID must be shown at the store, and there's a max of two reservations per customer. The availability of SIM-free iPhone X models for reservations will vary on a country-by-country basis. Last year, for example, SIM-free iPhone 7 and iPhone 7 Plus models could be reserved in Canada. Apple confirmed to us that Reserve and Pickup will not be available in the United States, but standard, pay-ahead in-store pickup is available. 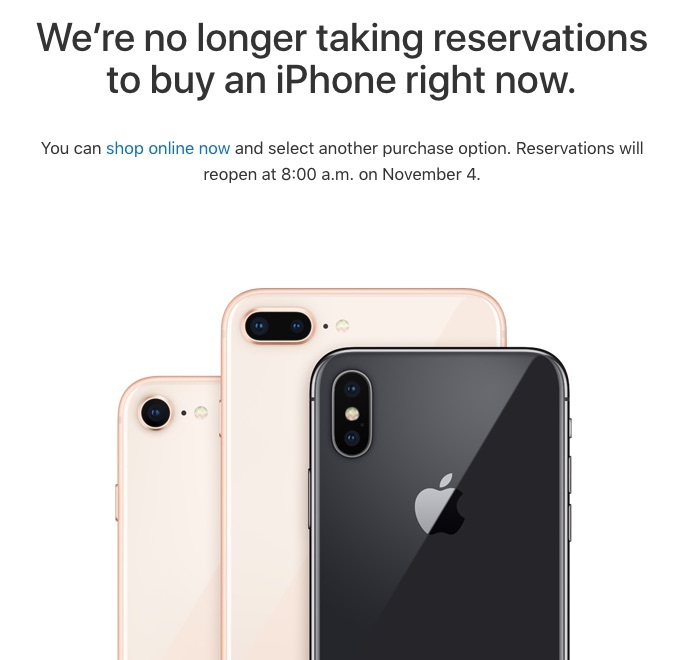 Update: Apple has adjusted the time for reservations to November 4 at 6:00 a.m. in Canada, Mexico, Switzerland, and the United Arab Emirates. Also, the pages in Australia and Hong Kong now say to check back on October 27, so it's unclear if reservations will still be offered in those countries. I should have said probably used Personal Pickup. I didn't mean to come across as lecturing you. How did you know the Reserve and Pickup link for the UK? It was buried to my knowledge. It was right there in the home screen of the iOS app when I opened it at 08:03 last Friday. I had two choices - pay and collect at store on 03/11, or reserve and pay in store on 03/11. iOS 11.1 fixed my iPhone 6 Plus' speed problem so I'm in no rush to replace it. I'll stop by an Apple Store once you can just walk in and pick one up and get a $200 rebate on trading in my old phone. Same here...anyone actually got through in UK? Nope not me....seems the other territories are also showing the same page. What? I reserved for in store pickup last Friday - in the UK. This isn't new. You used Personal Pickup, the standard in-store pickup option for pre-orders. 1. It bypasses the 5-6 week wait. 2. You pay upon store pickup. Still telling me to come back at 0600, very frustrating! 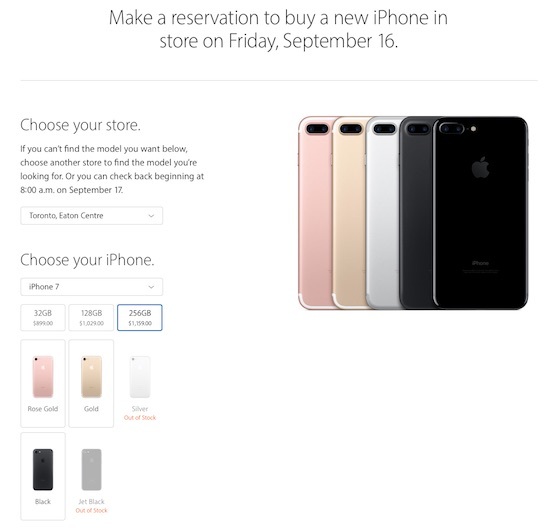 Wasn't Reserve and Pick Up available in the U.S. last year for the iPhones 7 and 7 Plus? As far as I remember, it was.